I recently took part in Blu Mudd‘s design challenge. Moriah isn’t making beads regularly anymore (she’s concentrating on her soap business) but she is still running regular challenges, which is fun! Now that the competition part is over, I can show you what I made. 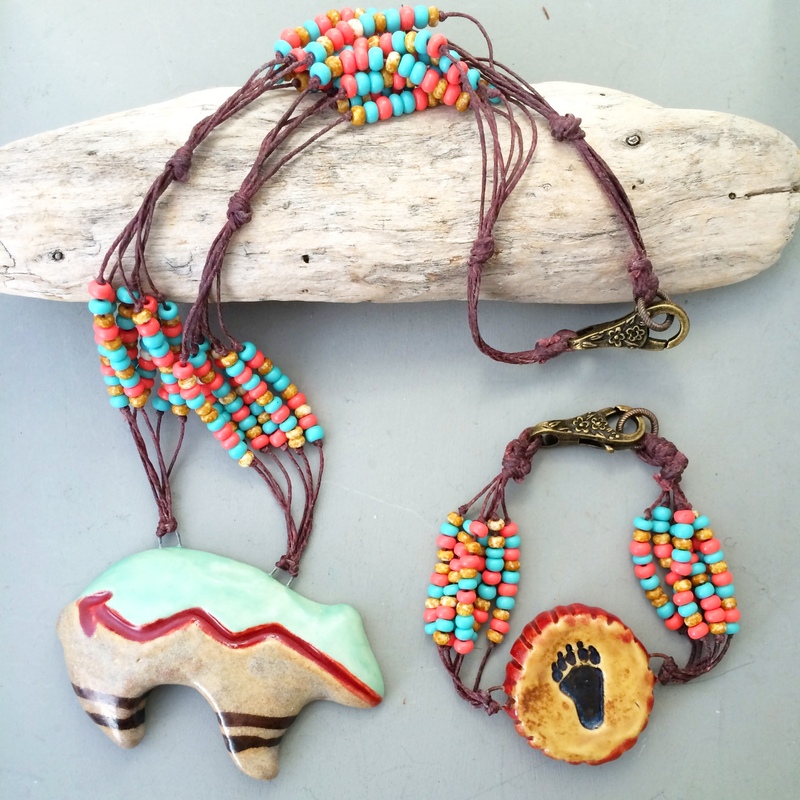 The theme this time was Southwestern, with a big bear pendant done in Zuni style, a connector with a pawprint and a feather connector too. To me, the first two components worked well together and the feather, with slightly different colours, stood out as a separate piece. I didn’t take a pic, so here is Moriah’s picture. I started with the feather. 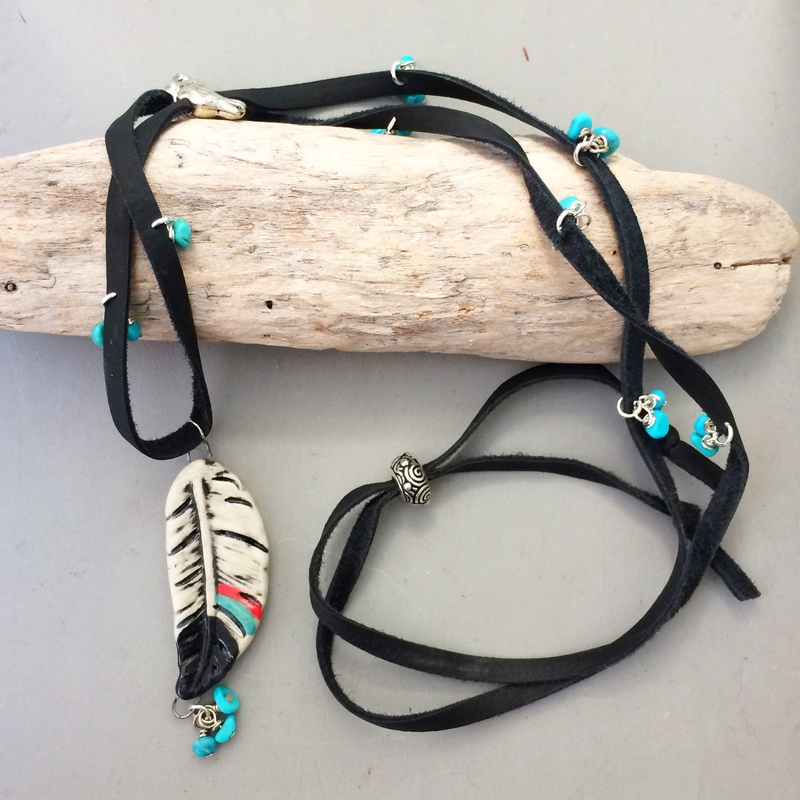 With its little turquoise stripe, I decided to pull out some turquoise nuggets and make a long necklace with the turquoise dangling along a length of black deer hide leather thonging. It’s simple, but it looks effective. 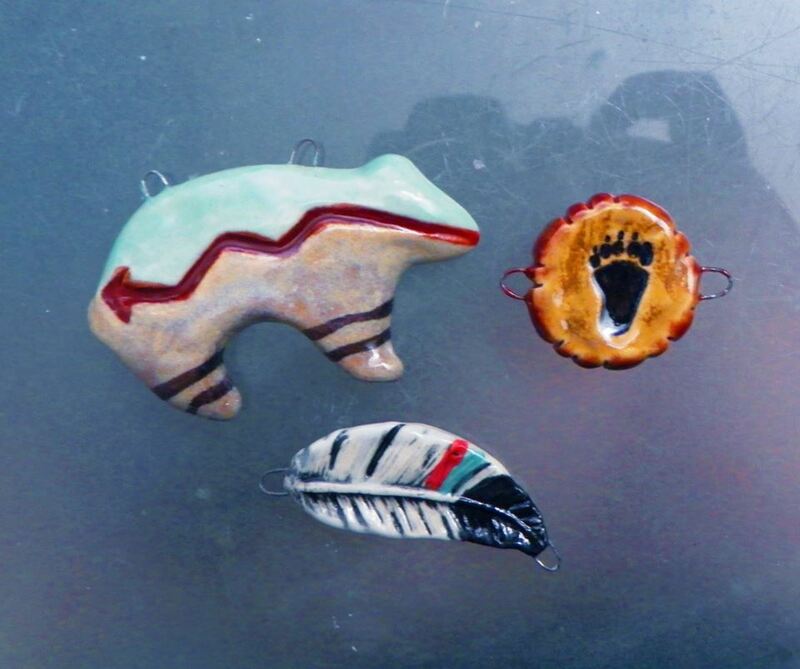 The bear presented me with a challenge—to balance the large size of the pendant with enough weight in the supporting necklace. I ended up knotting half a dozen strands of waxed linen on each side, with sections of seed beads in southwestern colours strung onto each strand. I used a similar strategy to make a coordinating bracelet with the pawprint connector. I’m happy with the results, the pieces have visual weight without actually being heavy. Thanks again Moriah for the challenge, it’s always fun to work with your pieces! I’ll look forward to the next one! You can see what others made here. 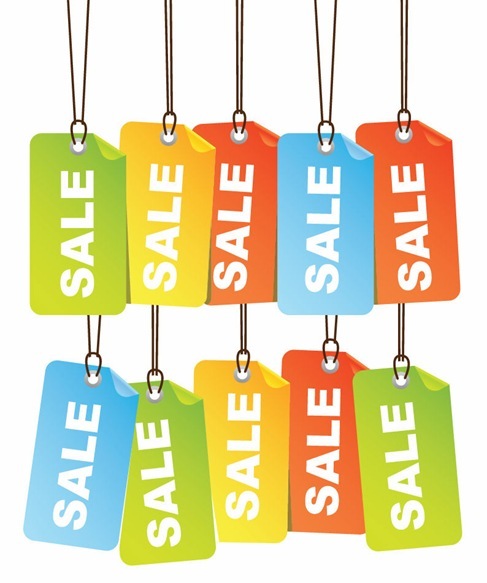 FLASH SALE in my Etsy Shop! I’m off on my big US holiday next week so I thought I’d have a quick sale in my Etsy shop before I close it until October. Use the code USHOLIDAY15 to get 20% off any purchase until midnight on Saturday 8th August (that’s in US eastern time, which is 2pm Sunday 9th August in Melbourne, Australia and 5am Sunday 9th of August in the UK). I’ll ship on Monday.